Cells of one particular kind, for example, dry cells, may be obtained in several different sizes, but so long as they are all made of exactly the same materials and have the same strength of electrolyte they will have identical e.m.f.s. The strength of the current which is obtained from a cell depends not only on its e.m.f. but also on the internal resistance. 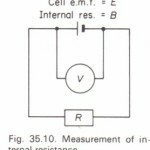 In order to obtain a large current, the internal resistance must be low. In the case of a lead cell this means that the plates must be of large area and placed close together. Also the strength of the electrolyte must be such that its resistance is as low as possible. According to its size and construction, the internal resistance of a drv cell varies from about 0.5 to 1.0 n, and the e.m.f. 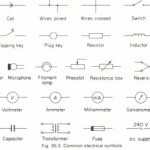 is about 1.5 V. If, therefore, the terminals of a dry c~ll were shorted by a piece of thick copper wire of negligible resistance the maximum current obtainable would be of the order of 3 to 0.5 A. This would be quite safe, but on the other hand, it would be dangerous to connect a piece of copper wire across the terminals of a 2V lead cell which had an internal resistance of about 0.01 n. The current in this case could possibly be of the order of 200 A. Harm would be done to the cell, and the wire would be liable to vaporize explosively, and burn anyone handling it. car battery, but they would be quite useless for working the starter owing to their high internal resistance.